Amanda Fleet: What is "success" in writing? 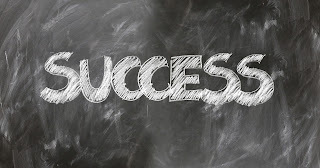 If you do a Google search for "success quotes" you will find a whole heap of motivational quotes and slogans about how to achieve success. But what if you don't actually know what success will look like if or when it happens? Is it getting published by a publisher? I don't think so - I've read many a book published by a big publisher (or a small publisher) and wondered how and why it got chosen out of the submissions pile. I've also read a lot of self-published books that have been brilliant. Who knows why the author hasn't been published by a big publisher - maybe they never sent it off to them; maybe they did and got rejected, they re-worked it and self-published; maybe the were rejected because the person who read it didn't like it but another person may have loved it. Of course, I've also read some brilliant books published by big publishers and terrible books that were self-published. Trying to predict whether a book will be good or not from how it got into print/ebook, is pointless. Is success selling a gazillion books and having multiple best-sellers? Maybe. Maybe not. I can think of some best-sellers I would be beyond proud to have written and have read and re-read because I love them. I can also think of a whole heap of best-sellers that were absolutely diabolical - badly written, badly plotted, badly edited... just terrible. One of the very few books I can't read. Every time I say "NOW I'VE GOT IT!" and by page 20 I'm asleep or try to kill myself with a wooden spoon. Eventually I ran out of spoons, but still the outcome was the same. People seem to love it, but I really can't understand why. Probably it gets better later. I may even try the zombie version, just in case. Reviews are very subjective - some will love a book and others will hate it. Getting good reviews isn't always a good indicator that something is good, any more than getting bad reviews indicates that it's bad, though maybe the spread of good to bad can be useful information. So if it's not how it's been published, and it's not necessarily sales and it's not necessarily reviews, what does indicate success in writing? What would you say indicates that a writer has become a successful writer? Drop me your ideas in the comments.